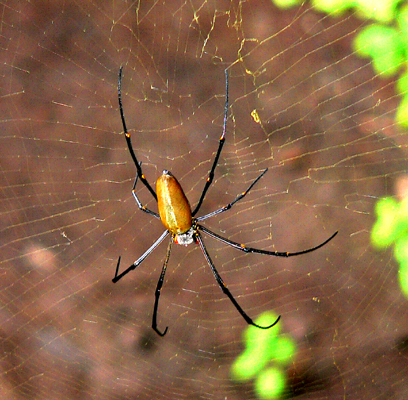 The spider is Nephila pilipes, female, a golden orb-web spider, very widely distributed in the tropics from India and Africa to China and northern Australia. They can have red or yellow knees. This photo of one with red knees and eyes was taken by me in March 2006 at Nourlangie Rocks in Kakadu National Park. They measure 20 cm from toe to toe and in my opinion are probably the most scary and evil looking spider ever! Lunch Date: Yesterday we went to Tours to take our lovely young Romanian friend Cristina out to lunch to celebrate her graduation and to thank her for her consistently friendly and professional dealings with our clients. She has been working at the Vouvray winery Chateau Gaudrelle as an intern since the spring, but today is her last day, then she's off to Paris for a few days with friends and back to Romania and job hunting. Charles from Chateau Gaudrelle was too busy to come, otherwise we would have included him in the lunch plans too. He tells us that the harvest has been disappointing. The quantity is only half what they would normally produce, for the second year running, so it's going to be a tough year ahead financially and to meet commitments to established customers. The sparkling wine is expected to be good, but the quality of the grapes has meant that they will make no very dry or sweet still wines and their typical sec-tendre Vouvray will be average quality. Nature News: A flock of Mute Swans flew over the house yesterday while I was hanging out the washing. You always notice Mutes because their wings make a loud noise. Sometimes it's a powerful whooshing sound, but yesterday's lot sounded a bit creaky, like clockwork swans. There was a big flock of cormorants descending on the Loire at Rochecorbon as we drove along the Quai de la Loire yesterday. It looked like some sort of feeding frenzy. This jelly fungus appeared a couple of weeks ago on one of the long forked poles I keep for propping up fruit laden branches in the orchard. The prop is made from a branch pruned last year from one of the trees (nectarine or apple I think). 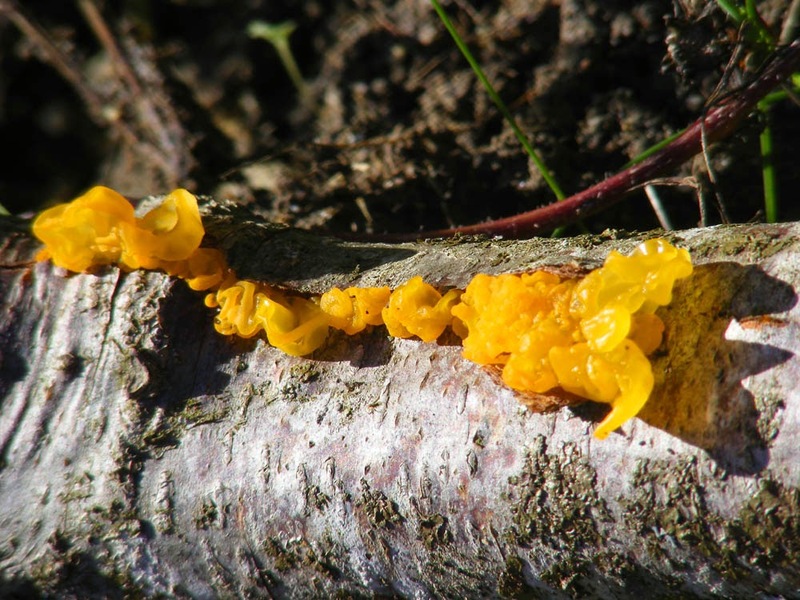 The fungus is Tremella sp. According to my mycologist friend Paul there are two very similar species, which require examination under a microscope to determine. Loire Valley Nature: A new entry for White Helleborine Cephalanthera damasonium has been added. Television Offer: We have two old style colour televisions, one small, one medium sized, both in working order if connected to satellite. Anyone who wants them is welcome to contact us and pick them up. We can be contacted by email via our profile links in the right hand bar. If no one wants them I guess we will take them to the tip. Renovation News: Yesterday we cleared out our front entry hall. We never use our front door, so the fact that the hall has been full of bricocrap for nigh on two years didn't inconvenience us in the slightest, which of course is fatal. Following our whirlwind of activity we now have paint neatly stacked on a shelving unit to the right of the front door and tiles to the left in the porch. The main hall is empty, awaiting me cleaning it, then we can put some more storage units in there and swap some furniture around so Simon's nice dining table can come in from the graineterie and the understair storage is more accessible. Naturally, like every other room in the house, the entry hall actually needs some final touches, like skirting boards, but they are not very high on our to do list. It's not quite true that the state of the hall didn't inconvenience us at all if I'm honest. For all of the time it has been 'in progress' and a dumping ground we have accessed the graineterie via a step ladder, which is a pain if you are carrying something. But the graineterie has a wonderful set of old detachable steps, which have lain idle propped up against a wall for two years. Now Simon is pondering the problem of how to reinstate them. The hefty wrought iron rings that take the steps' hooks are now too low because we've changed the floor level by laying terracotta tiles. The rings aren't budging no matter what sort of leverage Simon uses on them. Probably we will leave them where they are, at least for now, and put in new eye bolts at the correct level. A la cuisine hier: All the hazel nuts have been de-husked. Hurrah! and now we have to shell all the little blighters. Better get cracking! In the Middle Ages herbariums (herbiers) were collections of illustrations of plants, not dried plants. It was Lucas Ghini, a 16th century Italian physician and doctor to the Pope, who had the idea to dry actual plants for reference. The 18th century French scientist Larmarck said that you became a botanist by picking plants, studying them and creating a herbarium. In these early days, botanists were principally pharmacists, and the 19th century Ernest-Henry Tourlet (1843 - 1907) was no exception. He was an amateur botanist, and by profession a Pharmacist 1st Class. In those days there was two levels of qualification for many professions, and his father had been a Pharmacist 2nd Class. 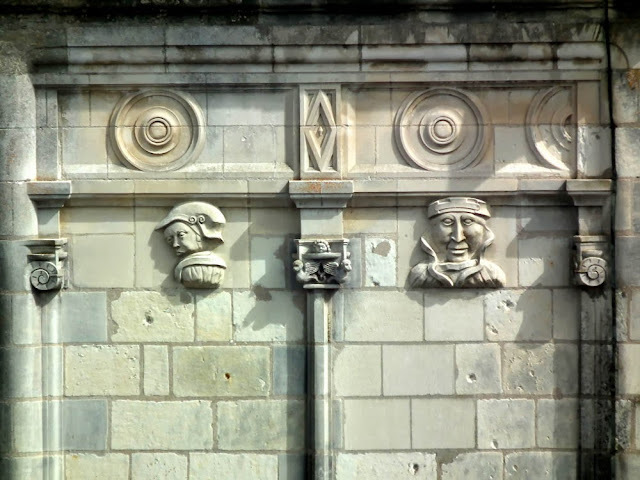 There was also two levels of high school baccalaureate, and so Tourlet, who began school in Chinon, his home town, had to finish at the prestigious Lycée Impérial (now Lycée Descartes) in Tours. He became interested in botany first through the influence of his father, and then with the encouragement of Alexandre Boreau, the Director of the Botanic Gardens in Angers. Although none of Tourlet's own pharmacy students took up botany, one of his sons became a doctor (the other was a career soldier killed in combat). After finishing school Tourlet chose to go to Paris to study pharmacy. (The only other place he could have gone was Strasbourg.) He took on some extra subjects at the Sorbonne, studying natural science and chemistry. He wrote his thesis comparing the lives of plants and animals. On graduation his first job was at the Hôtel-Dieu, the oldest hospital in Paris. The local botany club on the Puy Besnard just outside of Chinon, a site of high botanical interest that Tourlet must have known well. He was an inveterate botanist and collector, even collecting on his honeymoon in Arcachon. His wife knew what she was in for from the start, and it was she who gifted the herbarium to the School of Medicine and Pharmacy at François Rabelais University in Tours after her husband died. He created the most important herbarium in Indre et Loire, containing 11 000 sheets of specimens covering 1530 species, collected in almost every commune of the department. He also made a general herbarium, with plants from the whole of France, Europe and the French colonies, especially North Africa. The plant specimens were acquired by swapping, buying and collecting in the field. 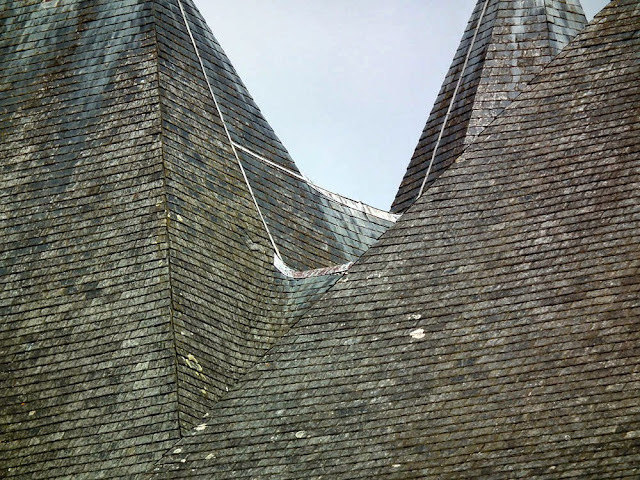 There is also a smaller moss collection which he created with two friends (together they were known as les trois Ernests). One of the members of the botanical society I belong to (the Association de Botanique et de Mycologie de Sainte Maure de Touraine) has recently reviewed all the identifications in this last herbier. A typical view of the countryside around Chinon. A botanist's activities in Tourlet's time primarily consisted of collecting specimens, either alone or in groups, identifying the plants collected, and putting them in a herbarium. To this end he carried a press, paper and pencils almost everywhere. Mostly he walked, often great distances. Later he might take a horse drawn bus in order to be able to range farther afield. When he became a bit wealthier he hired a Victoria (a four wheeled horse drawn vehicle) and after 1880 he travelled by train. He collected some species many times. 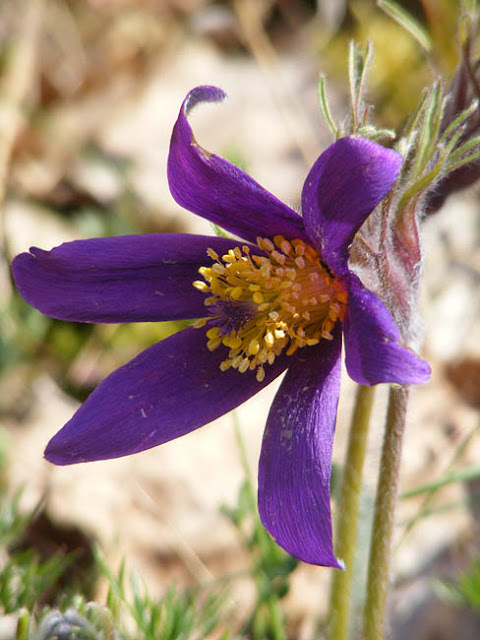 For example, there are 37 specimens of Pasqueflower Pulsatilla vulgaris in the collection. All his collecting trips are recorded in his cahiers d'herborisation (field notebooks). A network of other amateur botanists supported him, such as Aristobile in Preuilly, Sennegon in Chaumussay and Audebert, the head gardener at the Chateau of Candé. He would request that they collected certain species and their specimens would be dispatched by train to him. The bridge over the Vienne at Chinon (during the 2011 works to strengthen the Medieval foundations). Specimen plants were pressed and dried, then fixed to sheets of paper impregnated with the poison bichlorate of mercury to ensure they were protected against insects and mould. (Background levels of mercury in paper are about 0.3 mg/g, whereas Tourlet's herbier sheets contain 0.5 - 5 mg/g.) Each sheet of specimens was labelled with the name of the species, the place found and the date. The conservators working on the restoration of the herbarium had to have their urine tested once a week to ensure their levels of mercury were not going up. 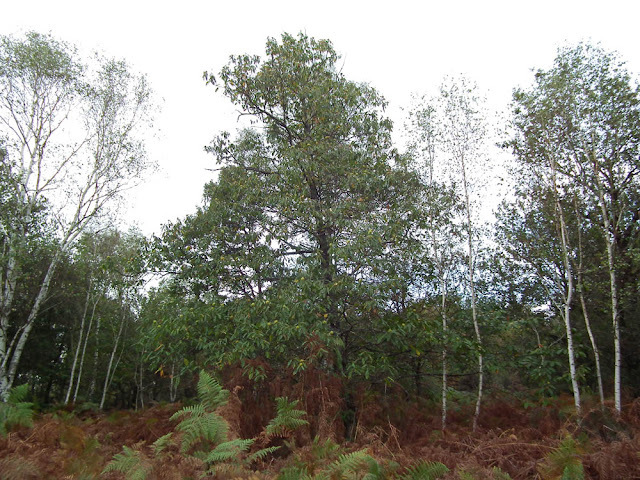 Determinations (identifications) were made using the work by DuJardin, the only good Flora that existed for the area. Tourlet also corresponded with all the prominent botantists of the time, such as Gustave Rouy and the Abbé Coste, as well as writing scientific articles himself. The arguments were starting between the lumpers and the splitters, so there was a lot of correspondence flying about! I love the French expression for those taxonomists who habitually split established species into many new species with finely nuanced differences -- they pulverisé les especes! Tourlet's penultimate project was to create an inventory of vascular plants in Indre et Loire (in fact, finished after his death by Jean Ivolas). It lists each commune a species was found, who collected it, any subspecies, and the type of habitat it preferred. Today it is responsible for certain plants believed to be locally extinct being refound. Finally, there is his Flora, still only in manuscript form, but with a dichotomous key for identifying the plants of the area. The herbarium is both a set of historical documents which must be preserved and a modern scientific study tool. It tells us much about the way of life of a 19th century botanist as it also includes more than just plant specimens -- scientific journals/articles, tickets and delivery notes, correspondence. There are so many documents we can follow Tourlet's life on an almost day to day basis. Like many of his generation he corresponded most days (including to fellow botanists on the eve of his wedding). The documents can be used to verify and cross reference the sometimes barely decipherable specimen labels. It is the only complete herbarium for Indre et Loire, and is an important tool for monitoring biodiversity today. The work is so thorough it can tell us not just about changes in wild plants but cultivated ones too. For instance, in 1802 there were 180 sericultures (farms growing silk worms) in the Chinon area. Tourlet tells us that by 1866, due to a severe outbreak of disease, there were only 70 remaining. We also know from Tourlet that by 1815 licquorice was no longer grown in the area, out competed by cheaper imports. Other aspects of history are touched on too. He records Hoary Alyssum Berteroa incana for the first time in 1870. It is not a native plant, but a weed which arrived as seeds in the hay brought to feed the Prussian horses when their troops invaded. Tourlet's herbarium holds the type species (echantillons types) for a number of French native plants. These are the benchmarks against which all other identifications of the species are compared and the specimen on which the original taxonomic description of the plant was based. The specimens can be used for DNA testing as they are already existing well identified plants with many samples immediately available. This is a surprisingly rare commodity. For all of these reasons the Ministry for Research provided a grant to conserve the collection and get it into a state where it could be used as a scientific resource once again. One of the main aims of the project was to put the collection online. When the University Pharmacy Laboratory team lead by Marc Rideau started, they had a working botanist's herbarium, not a proper archival collection. Specimens weren't fastened to their sheets, labels had faded. The first step was to re-present all the specimens, giving them new acid free museum quality paper (Heritage Woodfree) sheet backings, fixing them down with reversable glue (Evacom) and removing all metal fixings. The original sheets are quite well preserved, but without transferring the specimens to acid free (and mercury free) paper, they are impossible to use. Also the quality of the original paper Tourlet used fluctuated, probably with his changing financial circumstances and with changing manufacturing processes in his lifetime. Next the identifications had to be checked and new labels written (the old ones were frequently a challenge to decipher). The sheets were grouped taxonomically and put into sleeves. An image bank was created, including all the old labels. Now there is an online searchable database of the whole herbarium and the university has applied to Monuments Historiques for formal listed status for the herbarium, to give it legal protection for the future. This requires the creation of a new category of object which can be listed by Monuments Historiques. It has been a pioneering and benchmark project. The University now wants to assist with doing the same for every historic herbarium in France in museums and universities. Source: This post is written from the notes I took at a lecture given by Marc Rideau, Emeritus Professor, University of Tours. Apologies to Marc if I have misunderstood or got anything wrong. Fungi Foray: The Association de Botanique et de Mycologie de Sainte-Maure-de-Touraine will be holding a fungi foray in the Forest of Loches on Saturday 2 November. 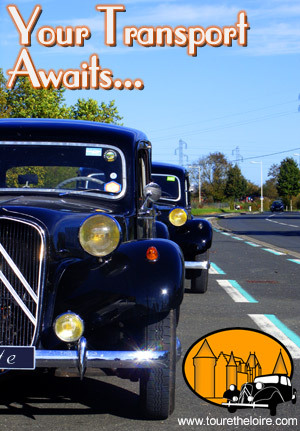 Meet at 2 pm at the Pyramide de Saint-Quentin (on the D31, Bléré road, between Saint-Quentin and Loches). The fungi gathered will be laid out and identified by experts at the end of the outing. The emphasis is on learning to identify all types of fungi, but there is nothing to preclude you attending and collecting edible species for personal use. Earlier this year a PhD student working on a project in the Forestry Department for the Institut National de la Recherche Agronomique (INRA) posted a request on an entomology list server that I am a member of. He is studying whether the introduced Western Conifer Seed Bug Leptoglossus occidentalis has the potential to become a serious pest in Europe. His request was to those entomologists based in North America who could provide him with samples from the bug's native territory. He wanted to compare the DNA of these specimens to specimens collected in France, to determine exactly where the French ones had come from. He received helpful responses from many of the list members based in the US and Canada. Several people said they had studied the species themselves and outlined their conclusions about its potential as an economic pest. 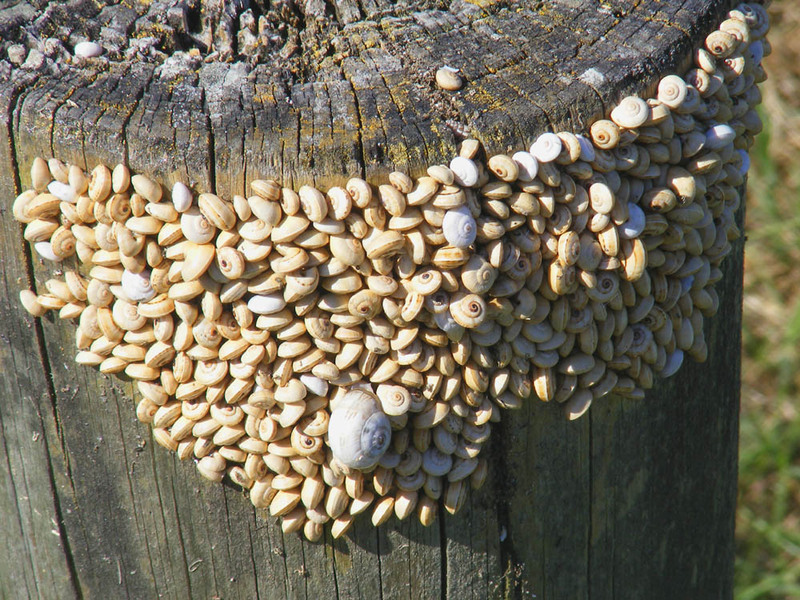 It seemed that it was just considered a nuisance pest, as it has a habit of overwintering in domestic dwellings, but doesn't cause commercial damage, even in high value seed orchards (plantations where the crop is tree seeds for propogation). Photo courtesy of Tim from Aigronne Valley Wildlife. That is, until a Canadian scientist mentioned that she had written a paper about the bug's ability to pierce plastic plumbing pipe! Everyone was fascinated, and the Canadian entomologist provided a link to her paper so we could read all the details. She was invited to study the bugs after a manufacturer of plastic plumbing pipes started getting reports of weeping pipes. From the beginning there was a suspicion that it was the bugs causing microscopic holes, as they were always present when this problem was reported and when examined under magnification it was clear that the holes were being made from the outside. Bugs were collected and put in boxes with various sorts of plumbing materials. Examination of the material showed that they had attempted to pierce everything -- all types of plastic and even copper. However, the only material they were capable of actually getting all the way through and causing a hole that leaked was PEX, an elastic polyethelene. These PEX pipes are 2mm thick and come in several colours. The bugs were not attracted to one colour over another, and there is no indication that they can sense the water inside. It seems that they instinctively try to pierce everything under their feet. So, if you discover mysteriously weeping pipes in your home, search for Western Conifer Seed Bugs inside. We've had them in our house, in the spare bedroom (which is alarmingly close to the small bathroom, as Tim pointed out to me when I emailed him to ask for the photos). The species is quite common now in France -- but don't worry too much, their pipe puncturing activities seem to be fairly rare. A la cuisine hier: Mussels, cooked in white wine with leeks, celery, garlic, parsley and thyme. Nature News: I've had an email from Carolyn, a contact in Amboise, who tells me she has just been involved in some hunt monitoring on the weekend. Apparently there was a battue (beat style hunt) of Cormorants planned on the Loire near Langeais. The League Pour la Protection des Oiseaux (LPO) got wind of this and arranged for its supporters to be prepared to be there and record the activities of the hunt. At the last minute, probably because there were going to be television cameras there, the hunt was cancelled. 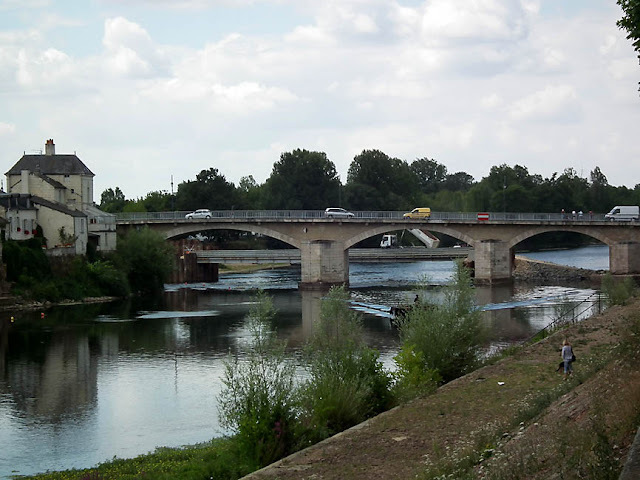 The LPO has sent a strongly worded letter to the Préfecture pointing out that the Loire is a nature reserve which acts as a wildlife highway and dormitory for all sorts of species, especially migrants. The high numbers of Cormorants in the area at the moment are due to birds that have nested in Scandinavia making their way back south for the winter. The nearest fish farm to Langeais is 11 km away, so there was no justification for the hunt, even if one disregards the fact that the species is protected. Carolyn clearly rather enjoyed the experience and said it "Ended up being a good chance to meet some interesting people and in a beautiful setting." UPDATE: Here is a link to the TVTours video of the event. I attended yesterday's fungi foray in the Forêt de Preuilly (fortunately the weather calmed down during the afternoon and we weren't rained on or at risk of being squashed by falling trees). Once I've catalogued my photos I'll write a post about the outing. 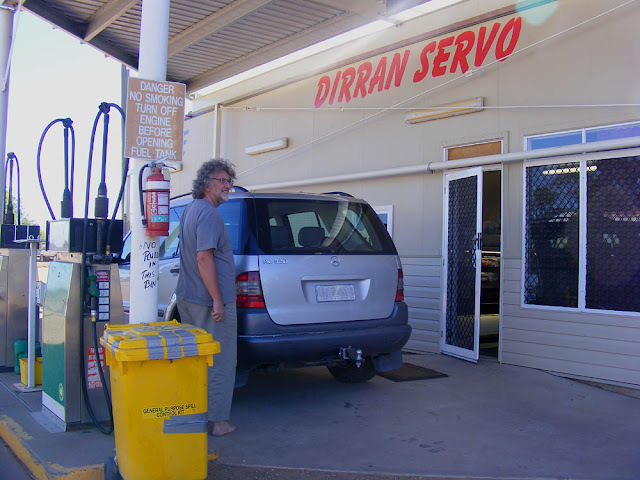 Filling up with petrol at the Dirran Servo (ie the Dirranbandi service station) last December. It's the only fuel available for many kilometres. The servos in the other small towns on the route in this area have all closed. A la cuisine hier: Red Fruit Sorbet, made from cherry vodka syrup and raspberry coulis. Cherry Trifle, made with lady's fingers soaked in cherry vodka syrup, jellied home grown black cherries and custard topped by cream and decorated with sour cherries pickled in vodka and a sprinkling of choc chips. Garbure, made with confit de canard, a jar of gésiers I had lurking in the back of the cupboard, a load of root vegetables, a can of beans and some ham stock. Oh, and cabbage. Pizza, topped with buffalo mozzarella and char grilled peppers. I made the dough from half white wheat flour and half wholemeal spelt flour. Served with a green salad. Orchard News: I gathered the last of the walnuts yesterday and pulled the last of the leeks. About half the leek crop went to seed. The saffron is flowering. It's always such a shame to pick such pretty flowers and throw the petals away. 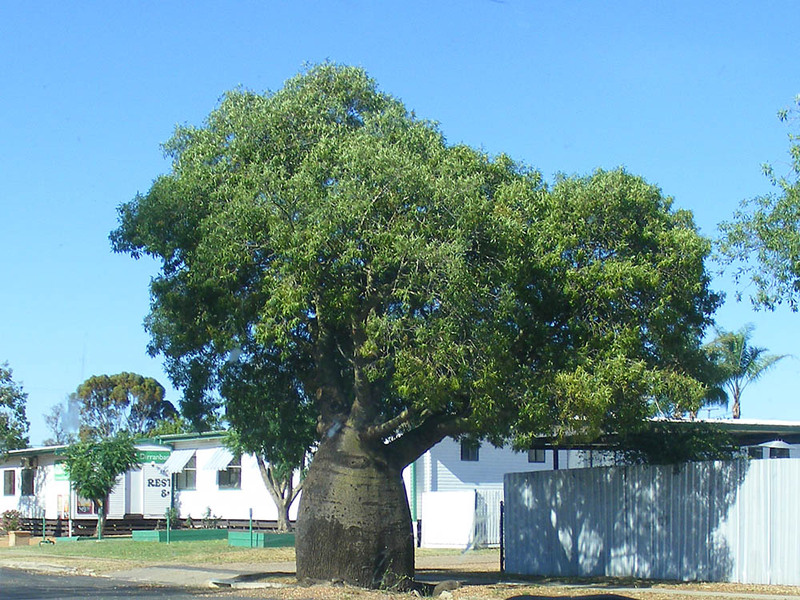 This is a mature Bottle Tree Brachychiton rupestris, a street tree in the outback town of Dirranbandi, Queensland. The tree is native to Queensland and is much prized as a cultivated plant now because it is very tough and has such a distinctive form. A la cuisine hier: Curried Carrot Soup -- zingily spicy, but (ahem) don't forget to remove the bay leaf before whizzing. 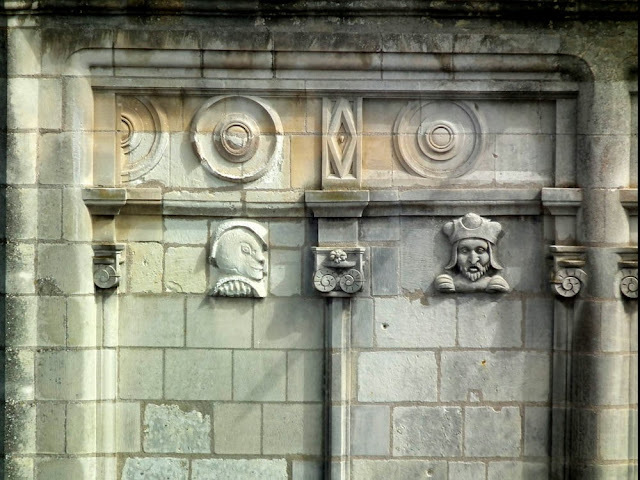 Quiz Answer: No one even made an attempt at guessing where the carvings on Thursday's quiz were, so I have posted the answer at the bottom of the post for those who are interested. 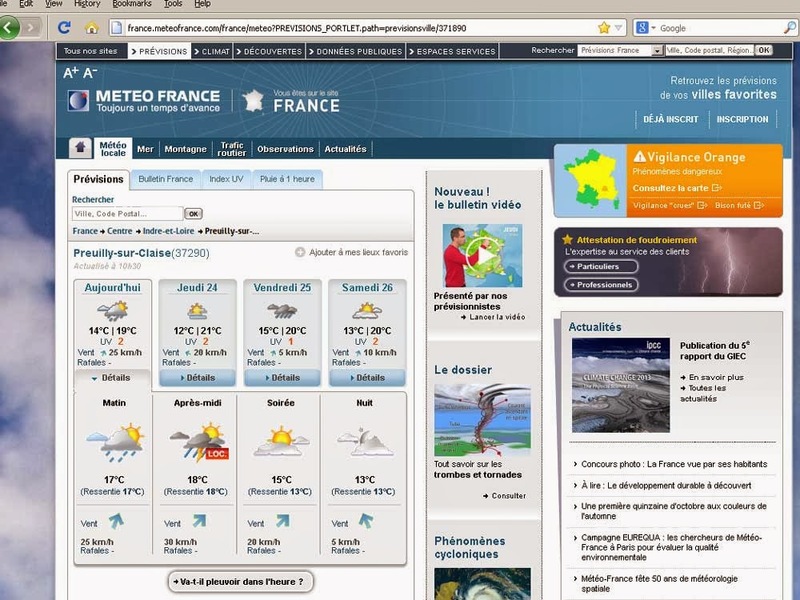 This is what the weather forecast was for Wednesday 23 October 2013. This is what we actually got. A timelapse video shot by Simon out of our office window. A la cuisine hier: Four duck legs have been rubbed with my secret* confit cure and have been left overnight. They will be slow cooked later today. *Salt, juniper berries, black pepper, thyme, bay leaf, pimento, coriander, sugar, garlic and eau de vie de prune. 4 points to anyone who can tell me where these carvings are (name of building required, not just place name). A la cuisine hier: In an effort to use up the clearly excellent but unloved cabbage in the fridge I made a small batch of coleslaw yesterday. Now, coleslaw is one of my least favourite things, but still I make it from time to time because Simon will eat it if it's doused in sufficient quantities of mayo*. In order to come up with something that might challenge my antipathy I tried this recipe from Clotilde Dusoulier on Chocolate and Zucchini. This undoubtedly means Simon won't eat it, but Clotilde is right -- ginger root makes a terrific flavour pairing with raw cabbage -- but that's about as far as I will go. Coleslaw is coleslaw, innit? That still left me with half a cabbage, so half of that has gone into chicken soup, my standard Yiddish Oriental fusion recipe. A good rich stock disguises cabbage admirably. Should I turn the rest into that cabbage soup classic from south-west France, garbure? I've got some duck legs in the freezer that need using. Or should I stir fry it? What would you do? *Ken -- I tried your 'chuck it all in together' technique, and it's brilliant! Quiz Answer: The carvings are on the Tour Saint Antoine in Loches. 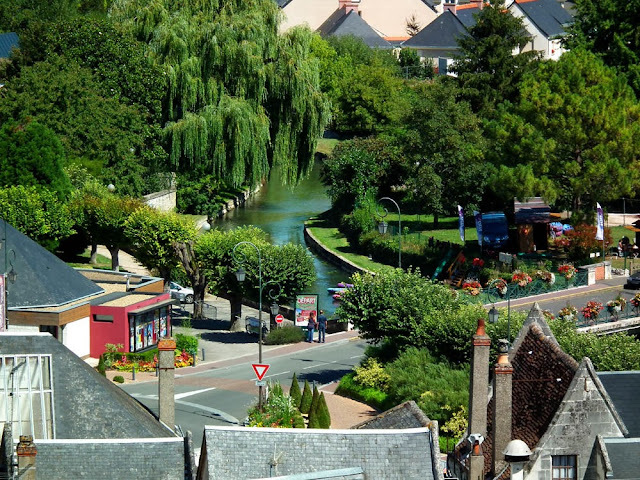 Beaulieu-lès-Loches sits just across the Indre river from Loches. Many of its buildings have a sort of warm and crumbling antique look, very picturesque. The huge church spire in the middle distance is attached to the remains of an enormous abbey commissioned by Fulk Nerra ('the Black Falcon'), Count of Anjou. This remarkably active and long lived 10-11th century war lord is buried in the church here and it is his legacy that the Plantagenet kings of England inherited when his descendent Geoffrey Plantagenet married Matilda of England in 1128. Fungi Foray: The Association de Botanique et de Mycologie de Sainte-Maure-de-Touraine is holding a fungi foray in the Forest of Preuilly on Sunday 27 October. Meet at 2.30 pm in the Etang de la Ribaloche car park. 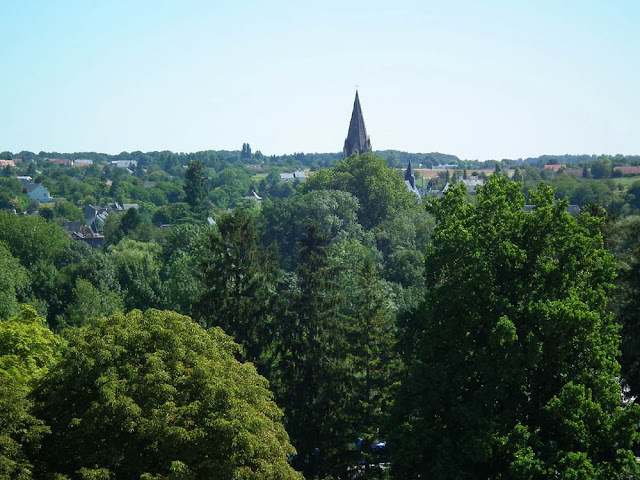 From Preuilly, take the D725 towards Azay-le-Ferron. After 5 km, at the lieu-dit La Lieutenauderie, turn left onto the D63c towards Obterre. The Etang is 2 km along this road. Coming from Loches or Ligueil, don't go all the way into Preuilly, but take the D725 to Azay-le-Ferron. As usual, the fungi collected will be laid out and identified by experts at the end of the outing. The emphasis is on identifying all types of fungi, but there is nothing to preclude you concentrating on collecting edible specimens for personal use. Registering to Vote: Yesterday we took ourselves off to the mairie armed with identification documents (UK passports) and proof of address (taxe foncière, electricity and water bills). We filled out the forms to get us on the auxiliary electoral roll so we can vote in European Parliamentary elections and local municipal elections. We cannot vote in French national elections because we are not French citizens. We can vote in the European elections because we are citizens of an EU country resident in the EU. We can vote in the local elections because we are EU citizens who live here permanently, but any EU citizen who owns a property in France and has paid their local taxes for a minimum of 5 years consecutively is also allowed to vote, meaning that many second home owners can vote. We cannot vote in Australian elections because we have been out of the country for more than 5 years. We could register to vote in British elections, but it feels a bit inappropriate since we no longer live there, even though we still have family there and financial ties. Results of Yesterday's Quiz: Jim and Pauline are the runaway winners with 6 points. The post has been updated with the answers. 1 point to anyone who can tell me what this is. 4 points to those who can tell me where this is (full name of village required, 2 bonus points if you can tell me how it is pronounced). A la cuisine hier: Stuffed Cabbage Leaves. We don't really like cabbage, so I cook it so it is heavily disguised. Stuffed Cabbage Leaves is an excellent way of presenting the nutritious outer leaves in an edible way. I bought the cabbage at the market and it was the squeaky freshest specimen ever, in tip top condition and looking beautiful. Raspberry Ripple Meringues, made with raspberry coulis I made earlier in the year from our orchard neighbour's raspberries, and leftover egg whites from custard making a few days ago. Movie Suggestion: Astérix et Obélix: au service de sa majesté. It's not as good as the others in this series, but it is still a fun way to spend a couple of hours practicing your French comprehension. Here is a link to the trailer. Australian Fires: Regular reader and commentor Sheila from Texas mentioned the unseasonable fires in Australia yesterday, so I thought others might be interested in this blog post, A Trip Through Hell, written by eminent entomologist David Rentz. He is talking about an area far to the north of the big fires in the news, but he wants to make the point that it is the scale of the fires and the attitudes of the landowners that is the problem all over Australia. 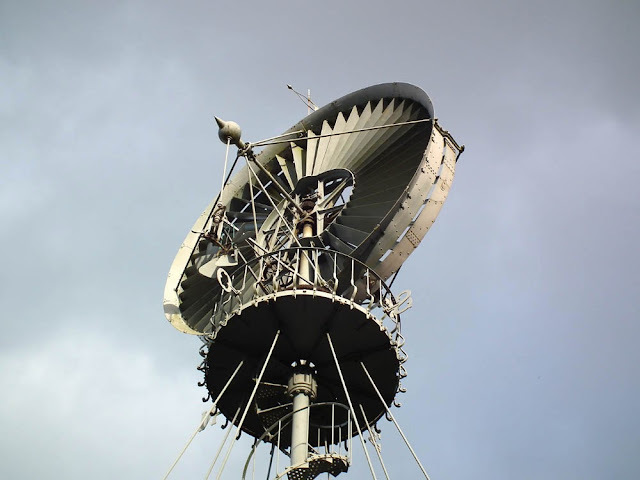 Answers to the Quiz: It is the Eolienne Bollée, a type of wind turbine for pumping water, at Esvres sur Indre. The name of the village is usually pronounced something like 'evruh syur uhndruh' but we have heard it pronounced as 'ezvruh' by someone on the bus. Congratulations to Jim and Pauline who scored 6 points and were exactly right about what it is and where it is. 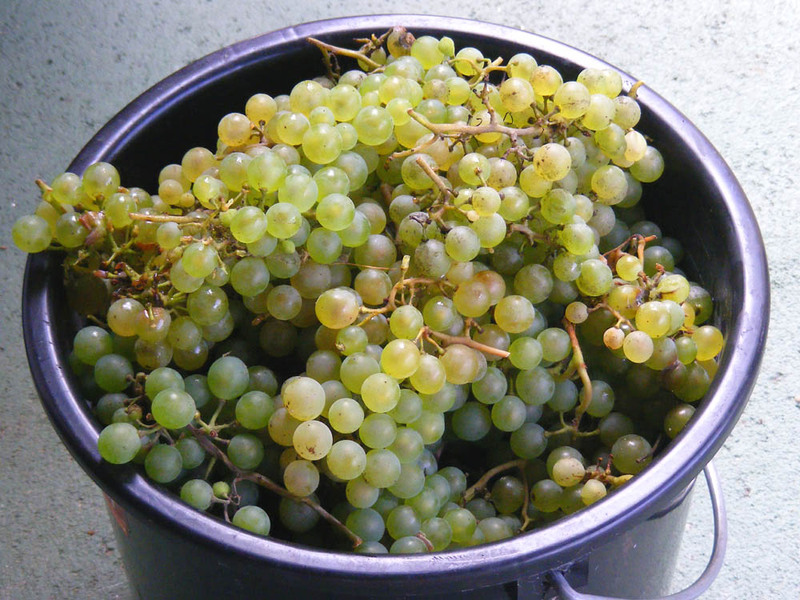 Chasselas is a variety of grape widely grown in the Touraine, but mostly by domestic gardeners growing it for the table. It is also grown commercially for the table and is considered a great seasonal treat in October. There are a few appellations which use it for wine making and I imagine it is widely used by non-commercial winemakers here. The grapes are small, green and globular, in small dense bunches and gaining a golden tan when ripe. They have seeds, but are considered so delicious that even the supermarkets stock them from September to November. Part of the bountiful harvest of Chasselas from a vine trained against a barn at the house of some friends. We have a couple of Chasselas vines in the orchard. They were grafted onto the rootstock by our orchard neighbour for the previous owner and planted along the fence near the potager gate. They produce small quantities of nice grapes, but I think are not really happy. A la cuisine hier: Swede and Celeriac Soup. Sounds ghastly doesn't it? Well, try it and you will be amazed (unless you are Simon, who was merely amazed that I thought it was really good). Dice and sweat an onion, 2 swedes and 2 celeriacs. Take your time and get lots of caramelisation happening, then add a litre of stock, 2 bay leaves and salt and pepper. Simmer for 25 minutes until really soft, remove the bay leaves, then add a quarter cup of milk and a handful of chopped celery leaves. Whiz to smooth, then add more salt and pepper to taste (be generous with the pepper). Swedes are what French and American people call rutabagas and Scottish people call turnips. You could use young real turnips in this recipe quite successfully too. Apart from diehards like Simon, I reckon the nice combination of sweet and savoury, without too much bitterness, would be an excellent way to convert people to eating swedes and turnips. Clafoutis, made with homegrown sour cherries that have been soused in a vodka based syrup. North African Style Potatoes and Beans. I used a can of the small green beans that are called flageolet vert in French. The potatoes and beans are cooked in a tomato sauce spiced with ginger, cumin and smoked paprika. 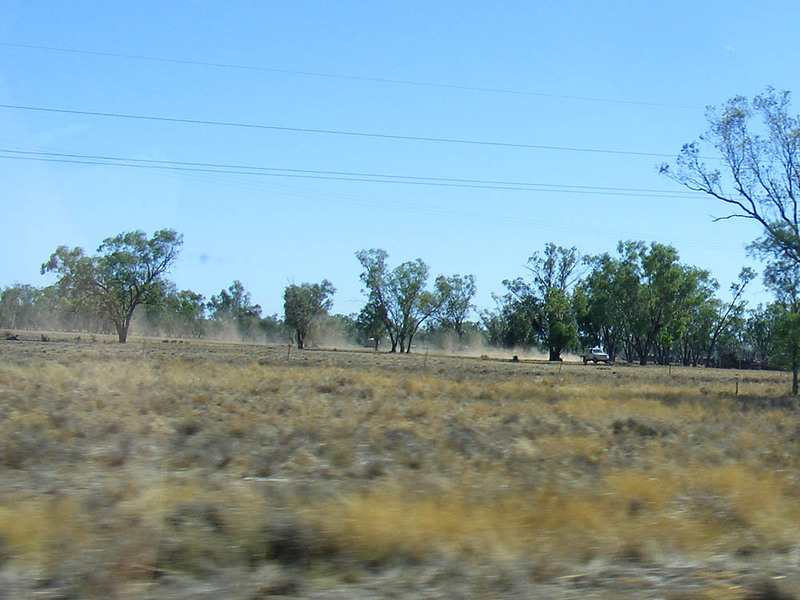 A ute leaves a pastoral property near Dirranbandi in December last year. One minute this country is covered in water, the next it's in drought. Actually, at the time we were there it was just starting to dry out. It will get much worse than this. The sensible stocking rate is about one beast per hectare here. A typical property will carry several thousand head of stock and have some cropping land as well. 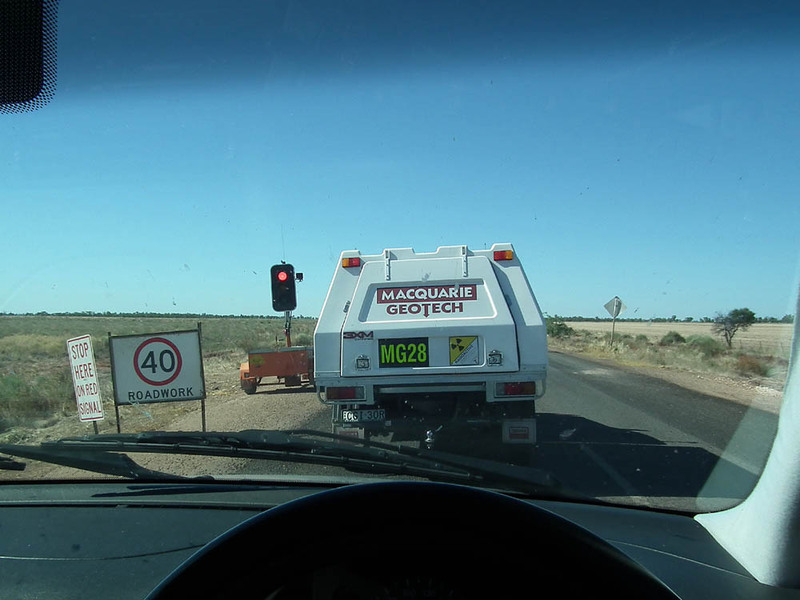 That gives you an indication of just how big a western Queensland farm can be. One of Simon's principal forms of entertainment when we lived in Queensland was to ask his cow cockie mate Greg how the drought was treating him. The colourful language that ensued could go on for hours. Ile de Ré Reflections: The island is connected to the mainland by a 3 km long toll bridge. It costs €16 to cross on to the island, but nothing to get off. A la cuisine hier: Simon made brioche for breakfast. He feels he can improve the results with a bit of recipe tweaking, but I thought it was pretty good. We ate it with quince jelly -- a perfect combo. Fungi Exhibition: I popped in yesterday to the fungi exhibition put on by the Association de Botanique et de Mycologie de Sainte Maure de Touraine. It's in Les Halles, opposite the mairie, and is thoroughly worth going to see. Dozens of species of mushrooms on display and lots of information about where to find them, how to identify them and whether they are edible or toxic. If you are just getting interested in mushrooms I would highly recommend going today while you still can. Lecture: I attended the lecture about Ernest-Henry Tourlet's herbier (pressed botanical specimen collection) yesterday. It was excellent, very well presented and full of information about the life of a 19th century botanist. Tourlet was a pharmacist from Chinon who amassed a vast botanical collection in the second half of the 19th century which was gifted to François Rabelais University in Tours on his death. The lecturer, Marc Rideau, oversaw the restoration of the herbier so it will survive for many decades to come and be a valuable study resource. It includes not only the sheets of pressed plants, but documents (correspondance, delivery notes, tickets, publications) that allow one to follow Tourlet's life on a day to day basis. Absolutely fascinating. The herbier has been digitised and is available online here. This is on the Castlereagh Highway between St George and Hebel in Queensland. The roadworks were part of a massive programme, still in ongoing in December 2012, to repair the road after major flooding caused widespread damage in January 2010. 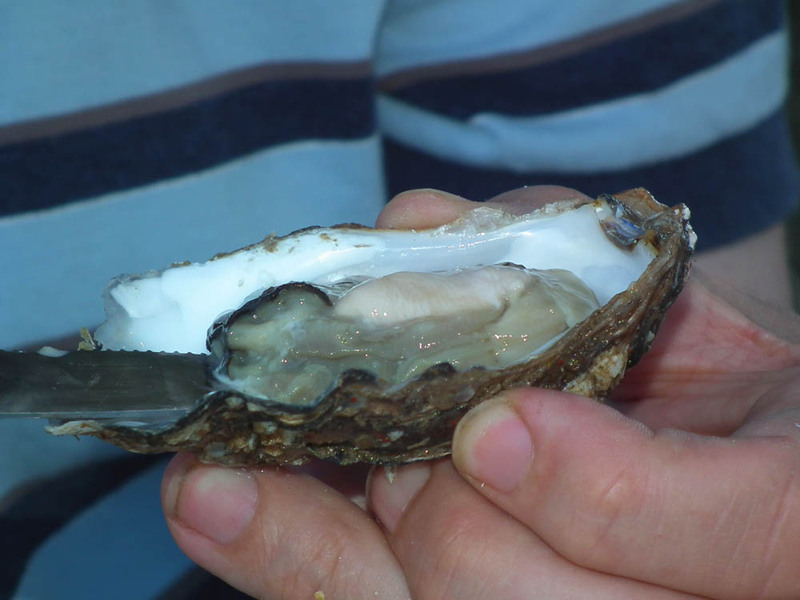 Ile de Ré Reflections: Oysters for lunch -- from La Flotte, bought at the market in Ars-en-Ré. A la cuisine hier: Apple crumble. La Tour Saint-Antoine in Loches. 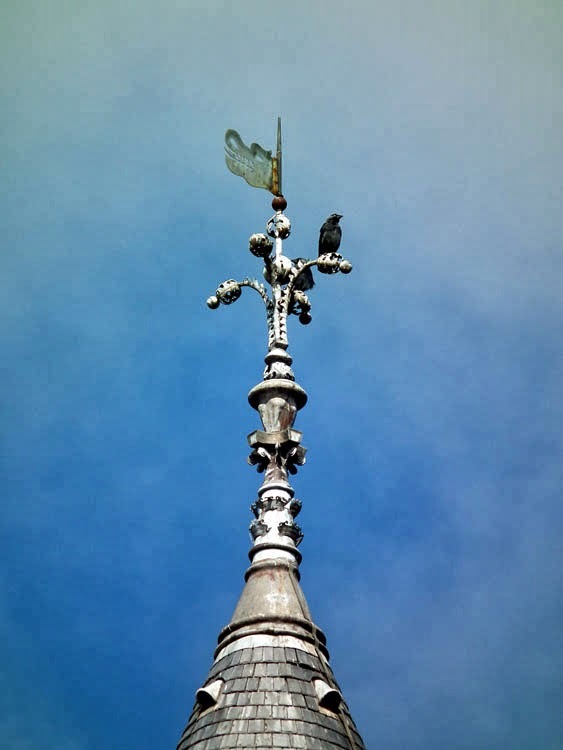 Former church belltower whose bells also served to sound the town alarm. It is 52 m high. 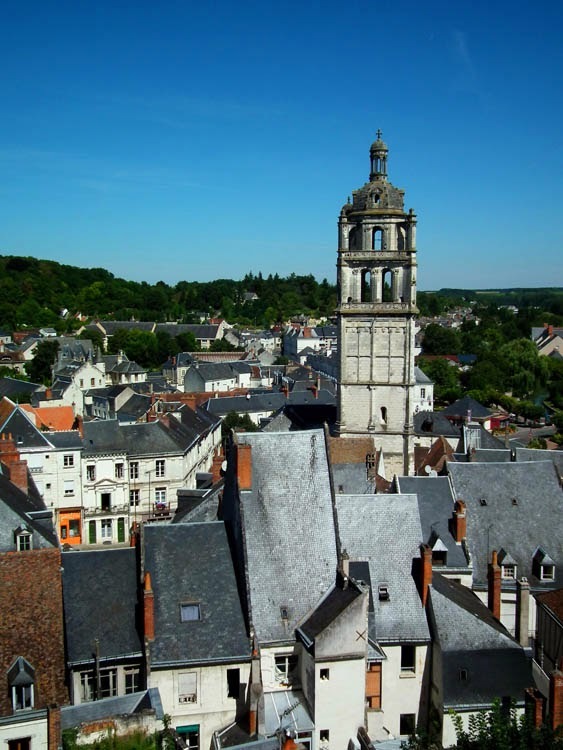 Constructed between 1529 and 1575 it is the only Renaissance free standing belfry in the Touraine. Access to the exterior is free. You can visit the interior on the Journées de Patrimoine. I love the oily sheen of the slate roofs in this picture. Orchard News: A goodly haul of walnuts collected and the last of the grapes picked. The first of the Ophrys sp orchid leaf rosettes has reappeared, preparing for next year after their brief autumn dormancy. A la cuisine hier: Dolmades, using up the last of the vine leaves I pickled in brine in the early summer. How Field Naturalists Die: Alex Wild has posted an informative graph on his blog Myrmecos. The top two reasons are vehicular and trauma, but you'll be pleased to hear that no one has been poisoned in over 20 years. Murder and execution is the third highest cause of death though – higher than animal attack, exposure, heart attack and infectious disease. Bee News: My friend Jill sent me a link to a well written, well informed article (for once!) in the Guardian about the plants bees visit most in the garden. It won't come as any news to gardeners that lavender tops the list, but it is nice to have it quantified and verified scientifically. Plant more lavender and oregano if you want your bee population to thrive! Wallflowers are the best for butterflies and pelagoniums are good for nothing. A view of Loches taken in mid-August. I can tell you it didn't look like that yesterday when I went shopping in the market. It was overcast and drizzly. 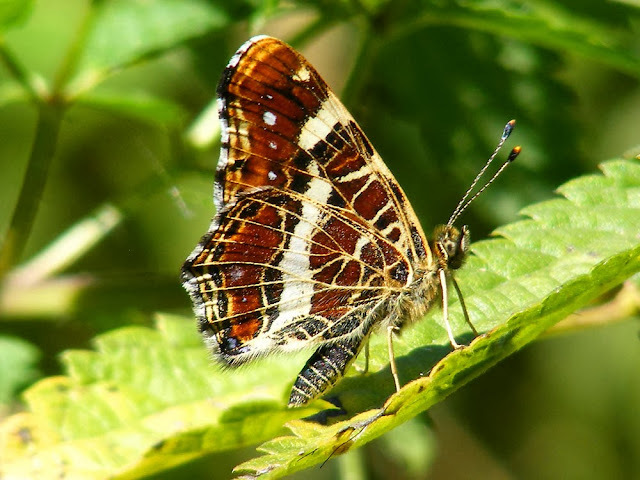 A Map butterfly Araschnia levana, demonstrating the reason for its vernacular name. The underside resemblance to a street map is so striking that is also called la Carte géographique in French. This one was photographed in early September, along one of the rural tracks behind Preuilly. 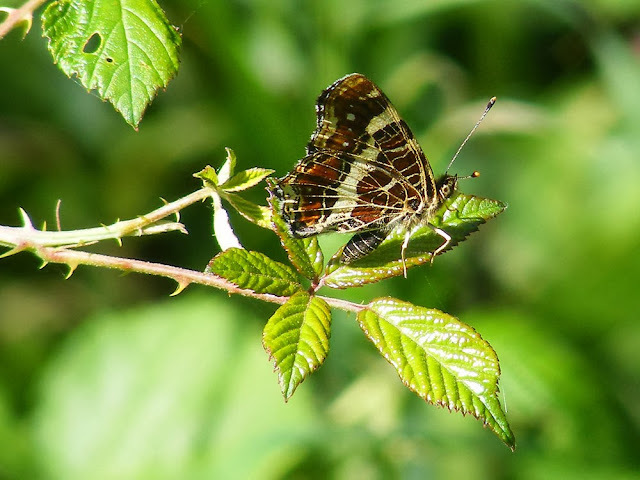 It is quite a small butterfly, and this year was abundant in the late summer. To see what the upperside looks like go to this earlier post. A la cuisine hier: Simon made a white milk loaf which turned out wonderfully well. I made a batch of apple pectin, to be frozen until next year's jam making commences. 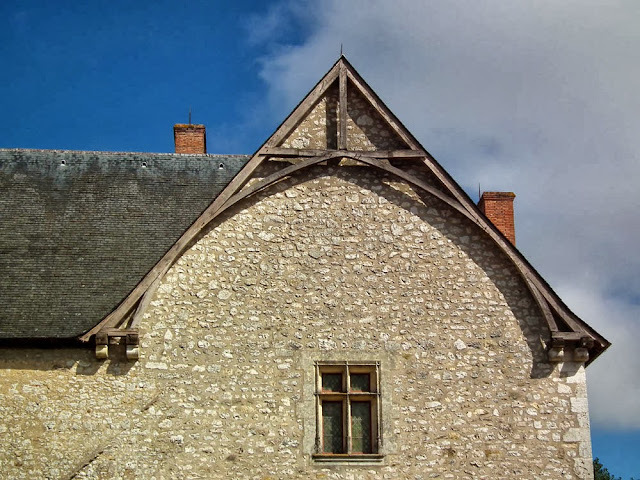 This wonderful late medieval chateau sits in the midst of the village of Fougères-sur-Bievre and gets very few visitors, probably because it makes a great drive-by so people content themselves with that. Also it is not one of the big name chateaux with their luxurious interiors and splendid gardens, and people with limited time will concentrate on those. 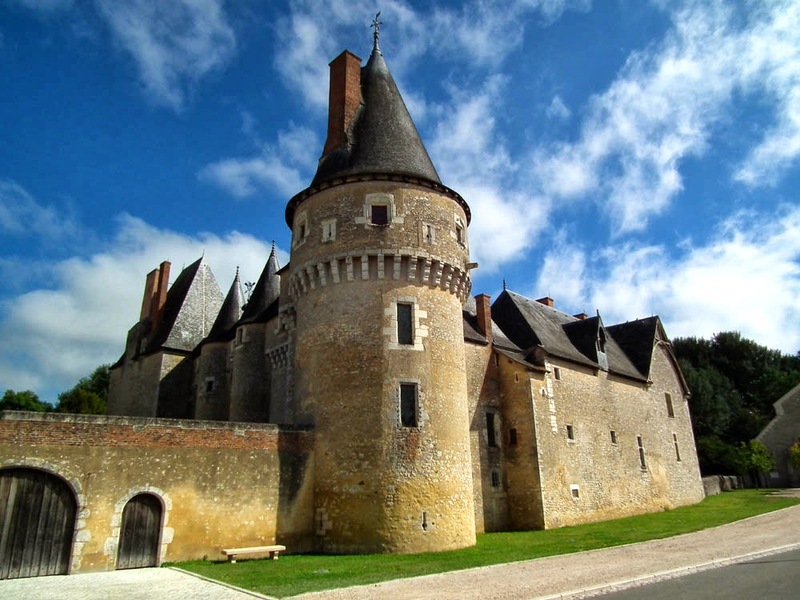 Its survival in such an intact condition is partly due to the fact that it is a defensive chateau built at a time when the family no longer needed to defend their home, due to the outbreak of peace and prosperity ushered in by the end of the Hundred Years War. Consequently it has never been damaged by seige engines or pounded by cannon and has remained a beautiful example of late 15th century architecture, never subsequently modernised (except for the roof and some minor details) because in the 19th century it was an industrial building and by the 20th century had become state property, listed as an historic monument in 1930. 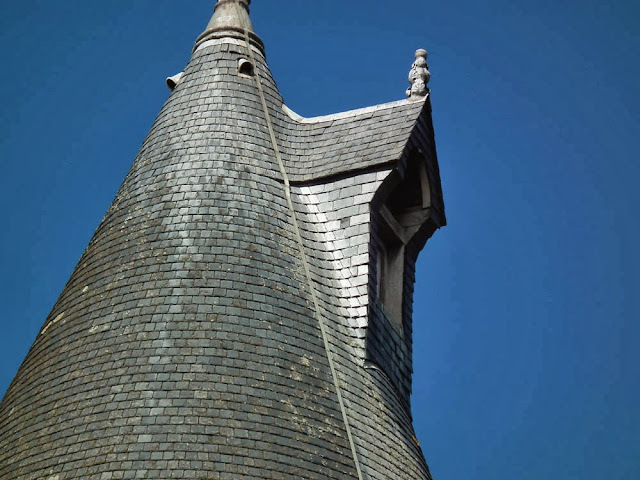 For more details on its origins see Niall and Antoinette's post on Chez Charnizay, 'Twilight of the Middle Ages'. Fungi Exhibition: The Association de Botanique et de Mycologie de Sainte-Maure-de-Touraine will be holding an exhibition of fungi in the Halles de Sainte-Maure on the afternoon of Saturday 19 October and all day Sunday 20 October. There is also a lecture on the 'Restoration and Historical and Botanical Interest of the Heritage Herbarium of Ernest-Henry Tourlet (1843-1907)' on Saturday 19 October at 2.45 pm. It will be held at the Salle de Rohan, rue du 11 Novembre in Sainte-Maure. The speaker is Emeritus Professor Marc Rideau from the University of Tours. In French. A la cuisine hier: 5 small jars of quince jelly. It is darker in colour and more brownish than the delicate pink of the apple jelly. Carrot Soup. I used some big homegrown carrots that we were given by friends, our own homegrown leeks, some milk that the laitière warned me was leftover from Saturday. Instead of the usual coriander seeds I used yellow mustard seeds. One box of the hazel nuts I gathered has been dehusked, and boy, was it tedious. Taking them out of their leafy calyxes is only the first step, and we've only done a third of the total quantity. They still have to be shelled and their inner skin removed. Never complain about how expensive nuts are in the shops -- it's because they are so time consuming to prepare. The big advantage of doing your own is freshness, and you know exactly how long they have been sitting on the shelf. Once they are shelled I will freeze them. Firewood News: Still no sign of our firewood delivery, but we have cleaned out the wood storage area in the garage. We've got maybe two days wood left. Weather News: Yesterday afternoon we stood at our back door and watched the rain approaching us across the valley. The sight was impressive enough, but what really struck us was the sound. It was quite strange to be able to watch and hear the downpour about 100 m away for a minute or two before it hit us. Quiz Results: Martine takes the points for yesterday's quiz. She guessed correctly that it was the Chateau of Fougères-sur-Bièvre, near Blois. 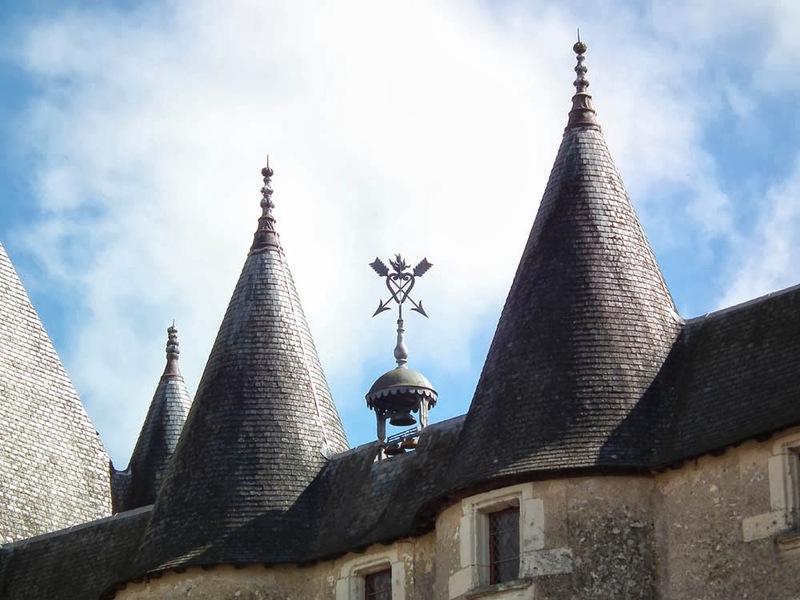 4 points to anyone who can name this chateau from these photos. I have given you a huge clue, if you know where to look for it. Weather News: The temperature suddenly plunged to 0°C overnight Saturday, resulting in a frost Sunday morning. We had to scrape the ice of the car windscreen in the morning and roofs were covered in frost. The television news the night before showed footage of it snowing in the Auvergne, up in the mountains. 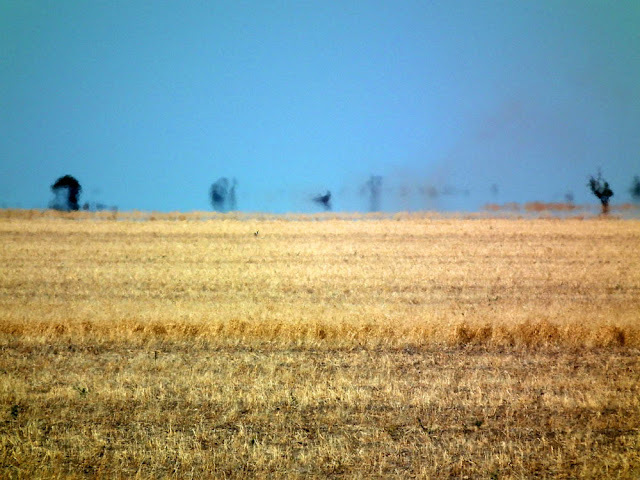 Heat haze on the southwestern wheat plains of Queensland just after harvest in early December. Ile de Ré Reflections: There were lots of these tear drop shaped bladder things in the rock pools above the oyster farms at Pointe de Grouin. 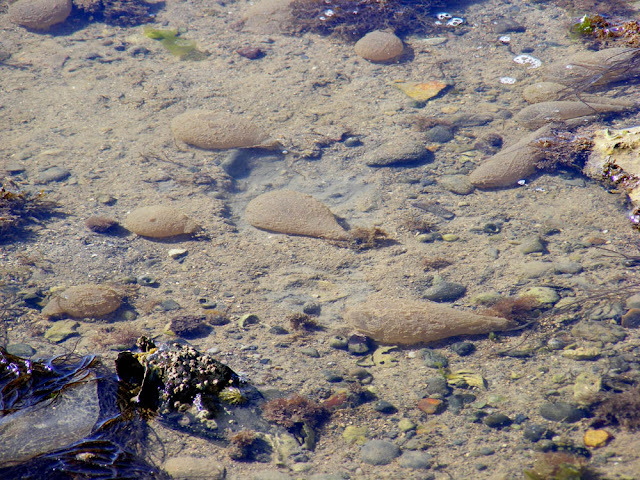 I don't know what they are (the remains of jellyfish maybe?). I didn't touch one, so I don't know what they consisted of really. 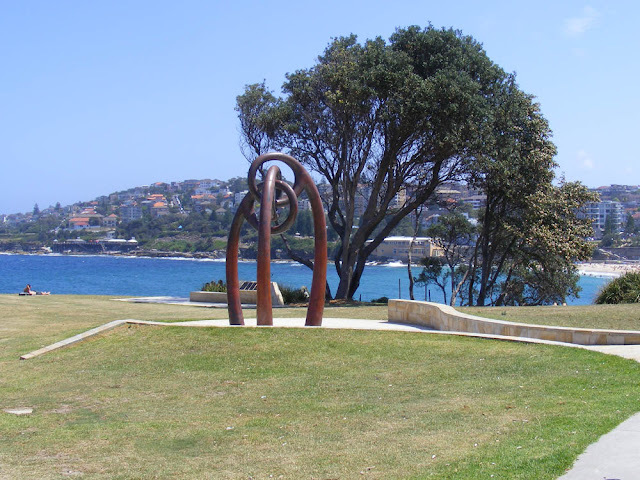 This sculpture is the memorial erected on Dolphin Point, Coogee, Sydney, to those who lost their lives in the Bali nightclub bombing of 2002. 88 of the 202 dead were Australian, 20 of them lived in Coogee and neighbouring suburbs, and six of those were members of the Coogee Dolphins, the local rugby league club. Ile de Ré Reflections: These tiny snails had congregated on all the carpark posts. 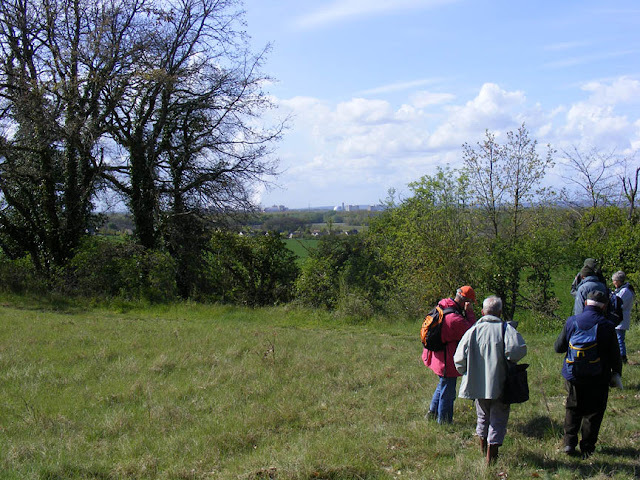 Fungi Foray: The Association de Botanique et de Mycologie de Sainte-Maure-de-Touraine will be holding a fungi foray in the Forest of Chinon on Sunday 13 October. Meet at 2.30 pm in the Saint-Benoit-la-Foret church carpark. The mushrooms gathered will be identified by experts at the end of the outing. The emphasis is on learning to identify all types of fungi, but there is nothing to stop you gathering edible species for eating at home later. 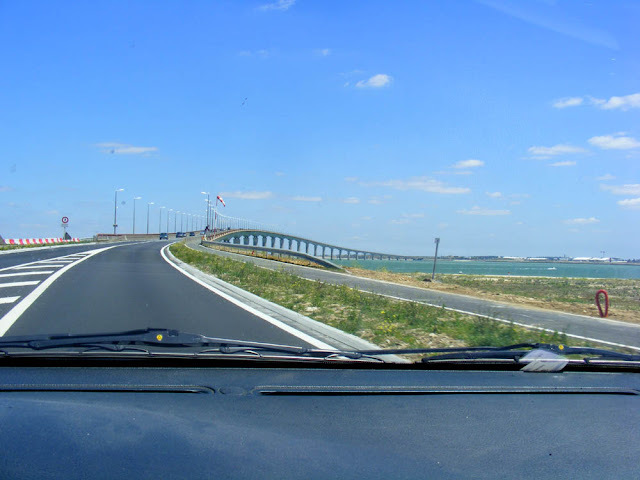 Car News: We replaced the back tyres on the Scenic yesterday, following a rather exciting episode which resulted in me ending up backwards and in the middle of the roundabout in front of IKEA in Tours some days ago. On a recent visit to a parcel of vines in Rochecorbon (Vouvray appellation) we had a discussion about the fungal disease esca. It's causing real headaches for the wine industry and we were able to take photos of affected vines and learn about how it is managed. The characteristic pattern that develops on the leaves of affected vines. I was impressed at how open the winemakers are about whether they have the disease and how much of it they have. It's the sort of thing that many industries would be very secretive about, just in case it damaged consumer perceptions. 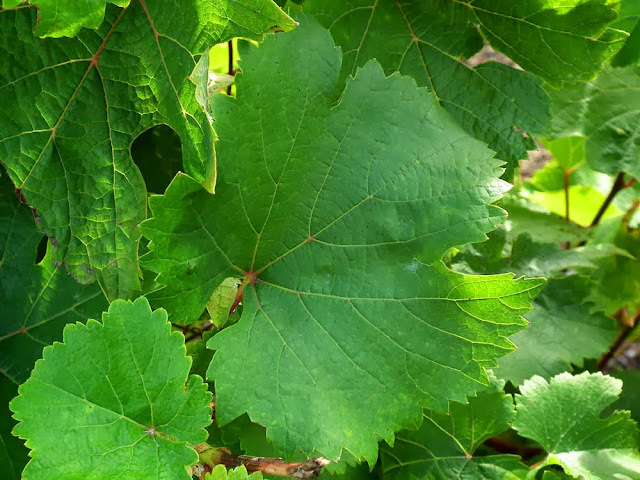 However, diseased vines sometimes limp along producing quite useable grapes for years before succumbing, so I guess the winemakers feel there is nothing to hide, and much to be gained by educating the public about what a serious threat it is. Plus, virtually every vineyard is affected. In the parcels of Chenin Blanc we looked at I would say there is currently one or two vines in every row with the disease. I was surprised to learn that they are just left there until 90 - 95% of vines are affected. They can't be treated as there is no known cure (apart from sodium arsenite which is banned because it is so toxic to everything, not just fungal diseases...). Once the whole parcel is diseased the vines are grubbed out, burned, and fresh certified disease free stock planted. 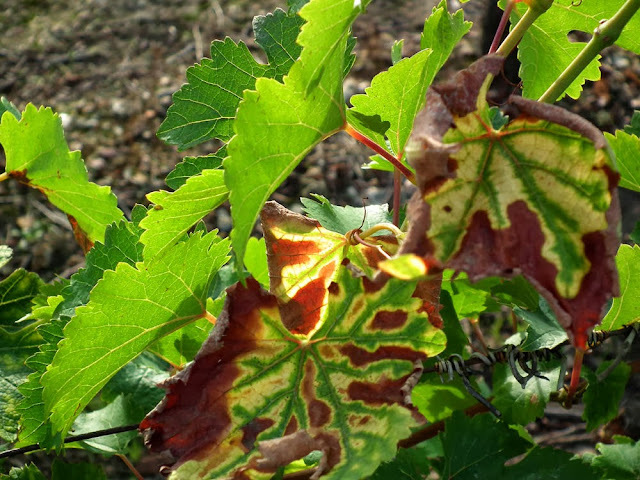 The vines here are being subjected to an outlandish sounding alternative treatment involving sound patterns and the affected plants are counted on an annual basis to see at what rate the disease is spreading. It is not cost effective to replace vines one by one as they become infected, and I suspect it becomes difficult to manage a parcel with grapes of many different ages. It is much easier to harvest grapes from a parcel that is all the same age. I was particularly surprised that infected vines are not grubbed out immediately in an attempt to prevent the spread of the disease though. I was also surprised that the soil is not usually left fallow for a significant period after the diseased vines are pulled out. 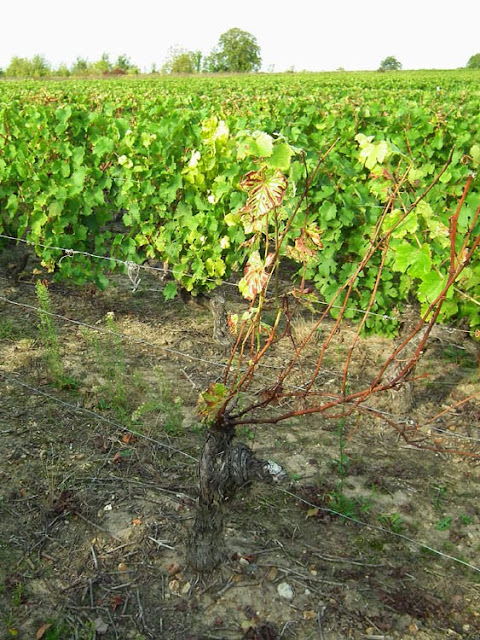 In most cases the new vines are planted within weeks of the old ones being removed. Possibly these measures are not seen as necessary because no one knows how the disease transfers from one plant to another, so it may be a pointless use of time. For my previous post about esca, which goes into detail about the effect the disease has on the vines, see here. Commercial crops of chestnuts are harvested in October by laying sheets out under the trees to collect the fallen fruits. The farmers get about €2.50/kg. Prices for canned chestnuts range from €6.95 to €10.96 a kilo. A 240g can of the most popular brand costs €2.63 at SuperU. Fresh chestnuts (marrons or chataignes in French) are €3 to €3.50/kg in Preuilly market. Marrons from our orchard neighbour. 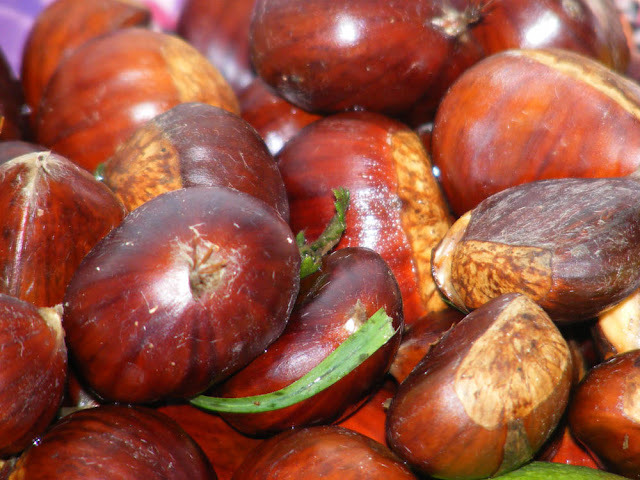 Every year you can sign up for forest randonées to go chestnut gathering in late October. If you do gather your own, make sure you process them within a few days or you will find a pile of frass and your chestnuts full of exit holes made by insect larvae that have been merrily feeding inside. A group of ripe chestnuts. They fall from the tree still in their prickly casing. Chestnuts are very time consuming and tedious to prepare, with tough rich glossy brown outer skins that come off to reveal not a smooth cream coloured nut, but a wrinkled and creviced object covered in brown wallpaper. It is this inner skin that takes the time and it is very difficult to winkle it out of all the nooks and crannies. You need to accept that a lot of your chestnuts will break in the process. 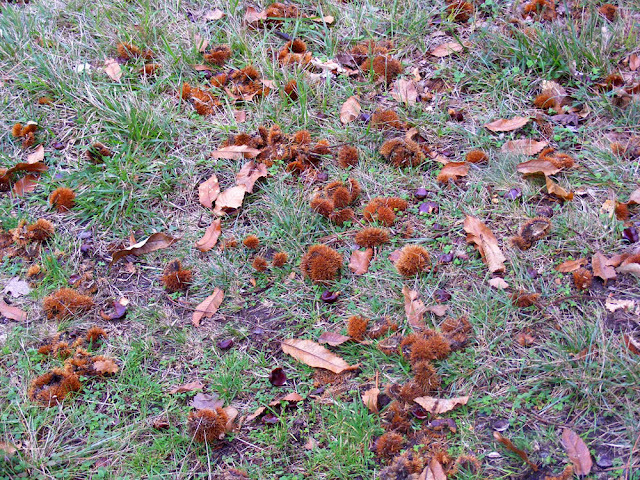 Chestnuts scattered on the ground under the tree. The method I favour is to slit the outer skin once or twice, then microwave them in batches of 10 - 20 for 2 minutes*. Thoroughly peel them while they are still warm (as hot as your finger tips can stand). They can be eaten at this stage (sweet and floury) or you can candy them by following the instructions here. Once candied they are very sweet, but retain that distinctive grainy floury mouthfeel. 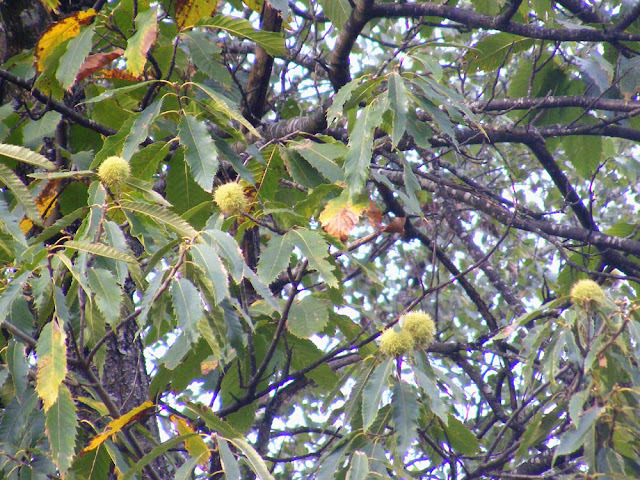 Unripe chestnuts on the tree. If you can't be bothered with all that, buy ready peeled frozen ones. 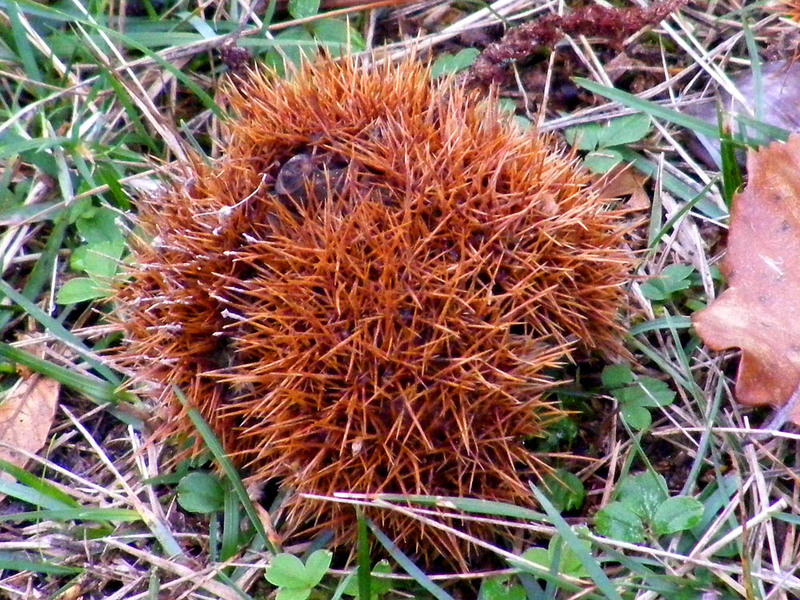 A chestnut tree in the forest (in this case a private hunting estate near Yzeures). *This top tip comes from a friend who overheard it in the marketplace in Preuilly. 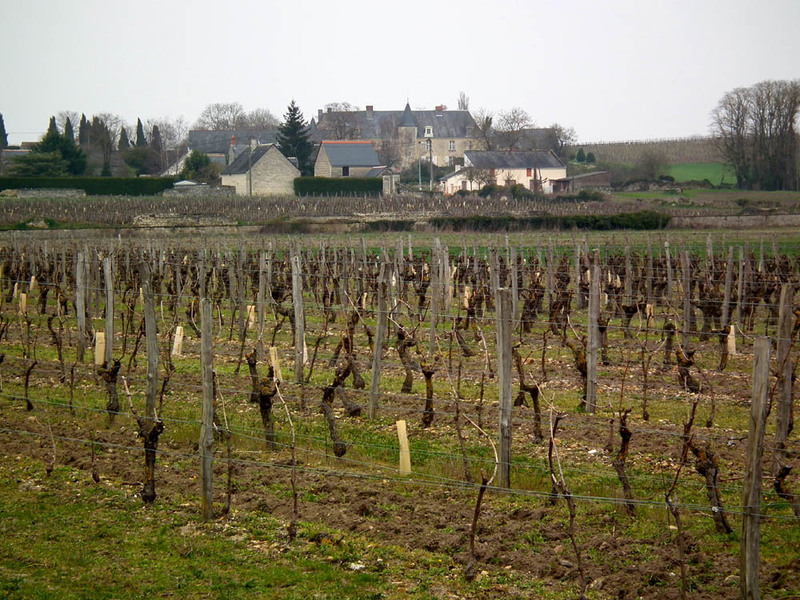 The vines are trained and pruned into a goblet shape. The top of the petiole (leaf stem), where it joins the leaf, is pink. Often the whole petiole and the leaf veins are pink. The young leaves have shallow lobes although very mature leaves can be deeply divided into lobes with lyre shaped cut aways. 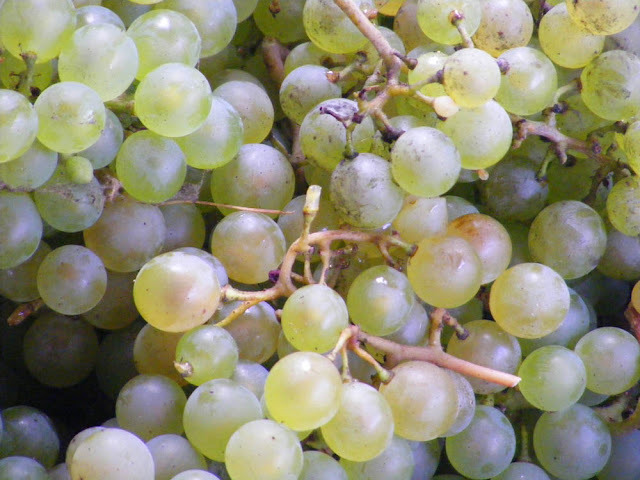 The bunches of grapes are long narrow cone shapes with small tightly packed berries. They are late maturing. 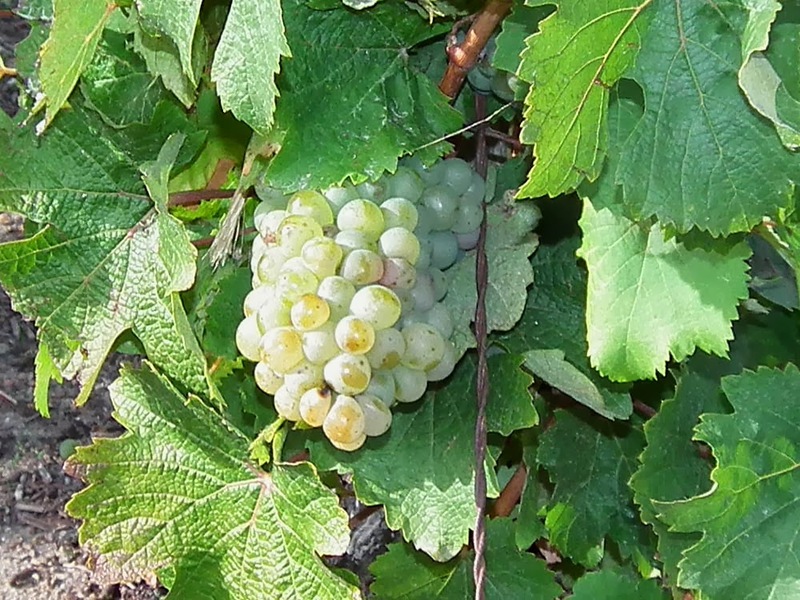 Of course, in Vouvray, where these photos were taken, identifying the grapes is easy because they are all Chenin Blanc, the only variety allowed by the appellation rules. Many thanks to Charles for the lesson, and apologies to him if I have got anything wrong or misunderstood. 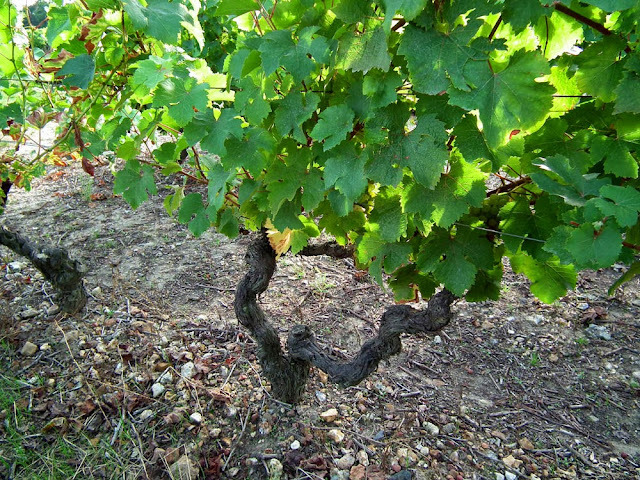 For my previous post on identifying grape vines see here. L'Art et Lard: The annual art and food festival held in le Petit Pressigny is on Sunday 13 October. For an idea of what you might see, here is our post about it from 2009. 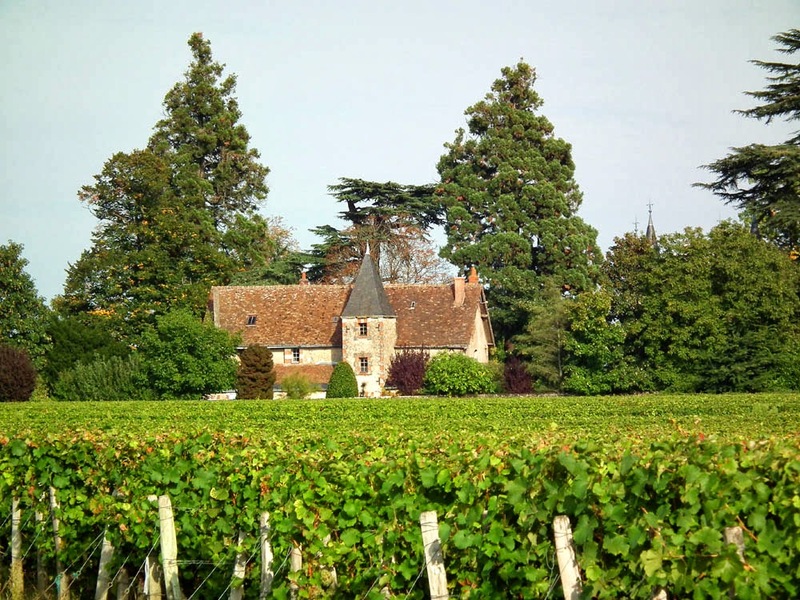 The Chateau de Montgouverne sits on the hill of Rochecorbon, tucked in amongst the grape vines all around it. 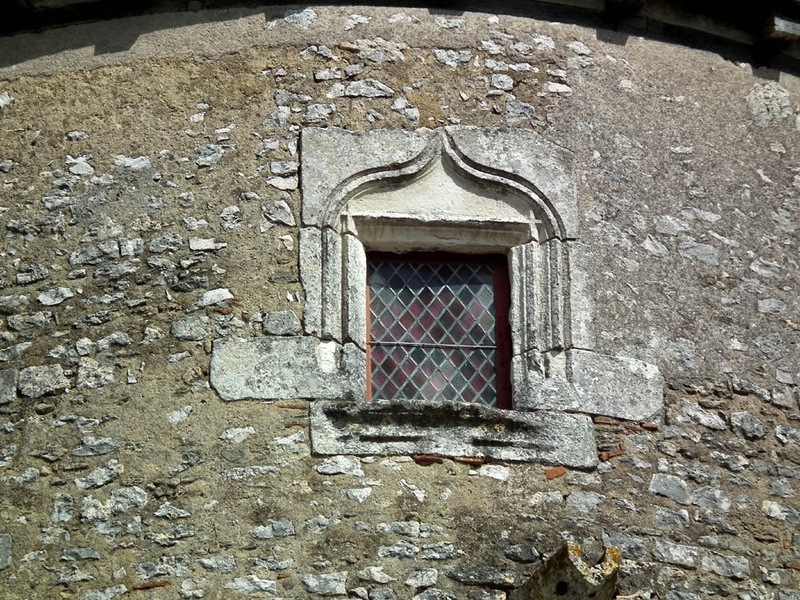 According to the thoroughly useful blog, Tourainissime, the chateau building is 18th century. You can just see its towers peeking through the trees on the right. It is privately owned. The building in the photo above is a 17th century enclosed dwelling on the chateau estate. Everyone who sees it, including the vineyard workers, would like to be the owner who lives there. Its setting and appearance is just so perfect. Orchard News: The Lizard Orchids are sending up big robust leaf rosettes ready for next year. I know this because I accidently mowed over several yesterday afternoon. No real harm done, as I always have the mower on the highest possible setting, so they have just lost the tips of their leaves. Friday's deluge obviously caused the ruisseau that runs along the front of the orchard to become a raging torrent. All the vegetation in the ditch is flattened and the culvert clearly didn't cope. There is debris all over the place and the water must have cut the road for a time. The general appearance of celeriac doesn't inspire much confidence in it being tasty, and even less so if you consider eating it raw. 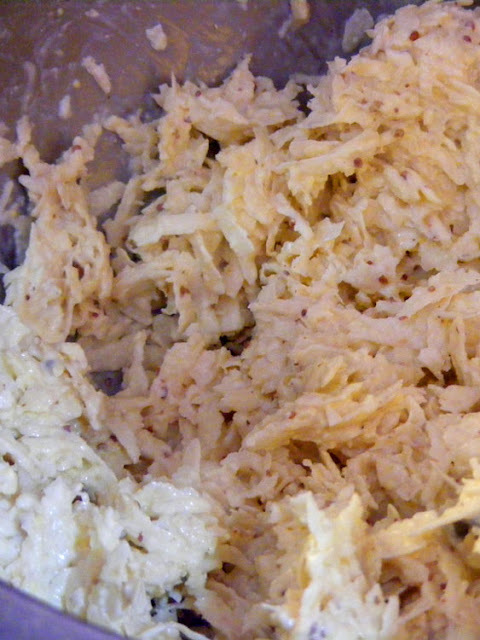 Nevertheless, the most popular dish using celeriac (céleri-rave in French) does indeed use raw, grated celeriac. Don't be fooled into thinking that this is diet food though. This is a dish to which cream is added in order to make it lighter (!!) and easier to digest (!!!) It is tremendously popular in France, but I don't think many people bother to make it themselves. Most people buy it from their trusted local charcutière traiteur (delicatessen). If you do make it at home, it's not just a matter of grating some celeriac and coating it with mayonnaise. There's a trick to getting the deli style céleri rémoulade, as Ken explains in his blog. David Lebovitz has a recipe and discusses the tricks to making it on his blog too. Make a mayonnaise by putting a whole egg and an egg yolk in a jug. Add a dollop of prepared mustard and some salt. Using a hand held blender, whiz the egg and mustard together, then start blending in a thin drizzle of olive oil until you have about two thirds of a cup of mayo. Then switch oils and add some sunflower oil in the same manner, until you have about a cup and a half of mayo. Next tip in a pot of thick cream (I use the 40% fat raw cultured cream I buy from my laitière) and whiz that around until it is all blended in. Now peel the celeriac. I find the easiest approach is to slice off the outer layer with a chefs' knife, like I would for pumpkin. Cut the peeled root into big chunks and grate it to medium shreds. 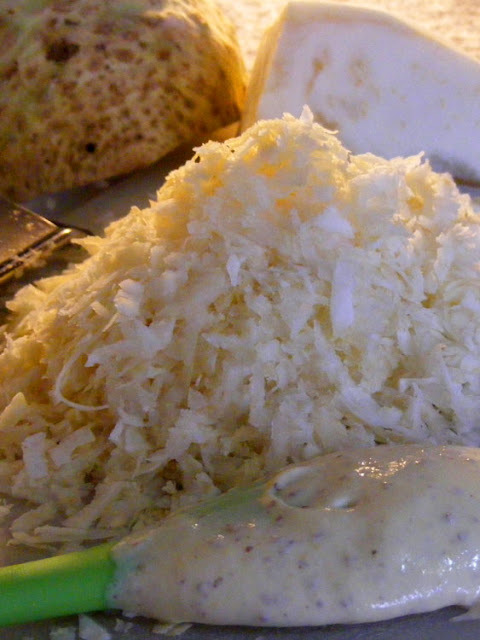 If you are grating by hand, as I do, since I don't own a food processor, it is a good idea to do it in stages and coat the celeriac with the mayonnaise as you finish grating each chunk. That way it doesn't discolour. Once you've grated all the celeriac, add more mayonnaise if you think it needs it. For an average sized celery root, about the size of a small melon, you will need to use about half the mayo you've made (use the rest on warm potato salad...). 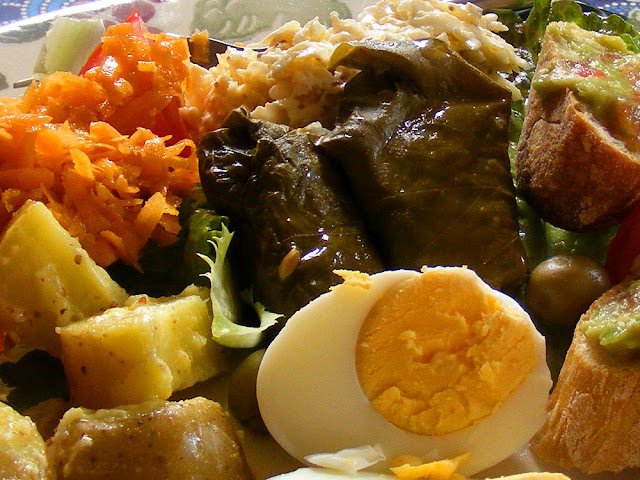 Céleri rémoulade (at the back) as part of a mixed plate of salads. The vegetable may be ugly, but it is aromatic (smelling of celery) and in a salad adds a crisp texture and a distinctly nutty flavour note. And homemade céleri rémoulade is quick, cheap and easy. A la cuisine hier: Wine Glazed Baby Pears, poached and coated in a red wine syrup flavoured with a few slices of ginger root, a cinnamon stick, lemon wedges and a vanilla pod, served with homemade custard.